This is the Coat of Arms of the city of St. Andrews in Fifeshire, Scotland. 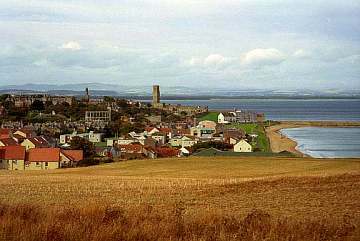 Of great antiquity, there was a time when it educated few scholars, and there were serious thoughts about re-locating it to Dumfries. 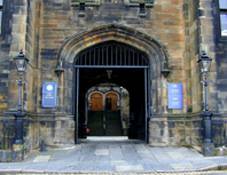 Thomas Chalmers re-invigorated it, and it never looked back. 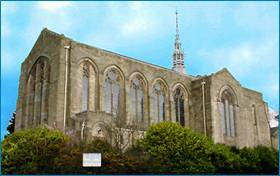 This is the great Church at St. Andrews. The entrance to the College. It is fascinating to think of all the illustrious persons who have walked through this. Andrew Gray was educated here, as was Thomas Chalmers, Thomas Guthrie, Andrew Bonar and Robert Murray M'Cheyne. 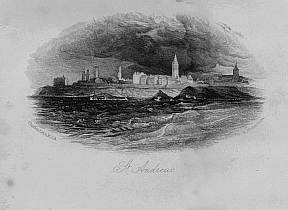 An old wood-cut of St. Andrews as seen from the sea. 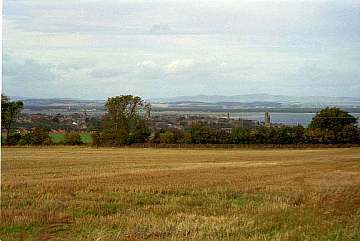 A more modern view taken in 2001 by your webmaster, which shows the old Cathedral tower (clearly visible in the old wood-cut) and the hills of Angus and Dundee, behind. Same time, place and author - but a bit closer. 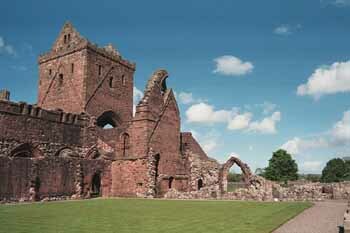 The splendid remains of a late 13th and early 14th Century Cistercian abbey founded by Devorgilla, Lady of Galloway, in memory of her husband John Balliol. Devorgilla is buried in the presbytery with a casket containing her husband's embalmed heart.